There are a lot of good things in my book Meat On The Side (I might be a little biased?). But this one really might take the cake—or the roll. All sitting on top of this little guy. It hits every high note. This is the kind of dish I make for company, or when I need to do something nice for my husband (I can be a cranker when pregnant). It’s really special, but not so fancy where you won't want to devour the whole thing in two bites. Mix the fennel, apples, jalapeño, lemon juice, orange juice, and salt in a large bowl, stirring until well combined. Set aside on the countertop to let the fennel and apples soften while you prepare the rest of the sandwich. Add the egg yolk, mustard, and garlic to a blender and blend on high for 10 seconds. Add the vinegar, salt, lemon zest, and lemon juice and blend again for 10 seconds. With the blender running, very slowly drizzle in the oil, starting with a few drops at a time. After you have added 2 to 4 tablespoons of oil and the aioli has emulsified and you see no separation, you can add the remaining oil in a faster stream as the blender continues to run. Scrape the thickened aioli into a small bowl and stir in the basil. Set aside. Heat the oil in a large skillet over medium-high heat. Stir in the celeriac, sprinkle with the salt, and stir again. Cook until the celeriac is tender and browned on all sides, 10 to 12 minutes. Meanwhile, melt the butter in a second large skillet or a griddle over medium heat. Add the rolls and cook until browned on the sides, 2 to 4 minutes. As soon as the celeriac is cooked, reduce the heat to low and stir the lobster into the skillet. Cook until warmed through, 2 to 3 minutes. Remove the skillet from the heat. Add the aioli and stir until well combined. 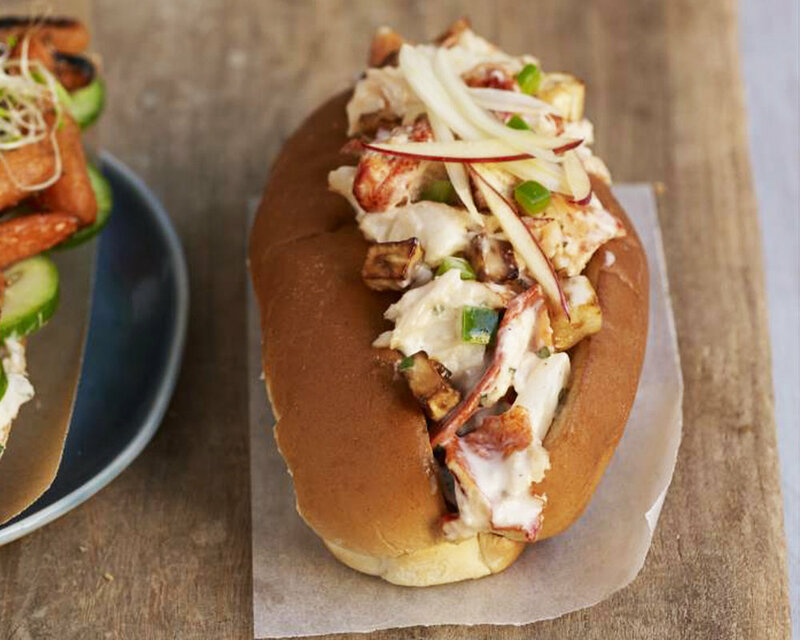 Spoon the lobster mixture into the rolls, dividing it equally. Top each roll with one-quarter of the slaw. If you’re not in the mood to make your own aioli, skip it and use ¾ cup mayonnaise instead, adding the basil, a squeeze of lemon juice and a little grated garlic. Fennel has a nice licorice flavor, but can be replaced with a small red onion or cabbage in a pinch. If you have some tarragon on hand add it when using these substitutes. Go ahead, make the slaw in advance. You’ll get a jump on the prep and the longer it sits, the better it gets. For simpler slaw use, ¼ teaspoon crushed red pepper flakes instead of the hot pepper, and just lemon juice instead of both juices. Make this a meal a bit more accessible by substituting shrimp for the lobster. Or for a different take on things, chopped chicken breast makes for one heck of a tasty sandwich, too!